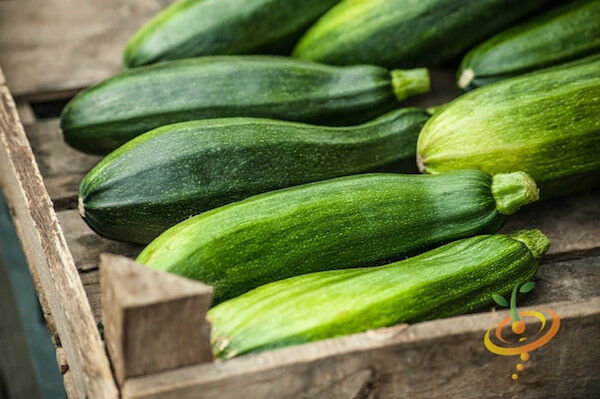 With so many zucchini varieties to choose from, it can be hard deciding which variety is best for your garden. Fruit Type is usually the first consideration for gardeners thinking about which zucchini varieties to try, but vine size is also important, especially for small space or container gardeners. 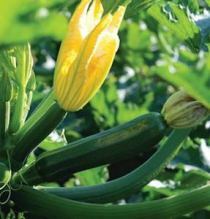 Disease Resistance can also be a factor, especially if you're growing zucchini where particular diseases are prevalent. Fruit Type. 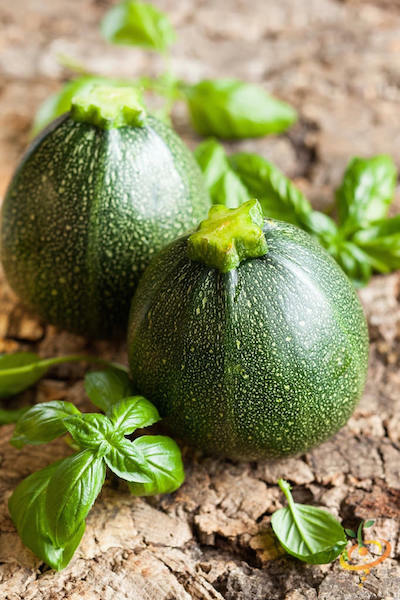 Green, cylindrical squash are what most people think of when they think of zucchini, but the color can vary from a solid, deep green, to lighter shades with streaks or blotches of darker green. 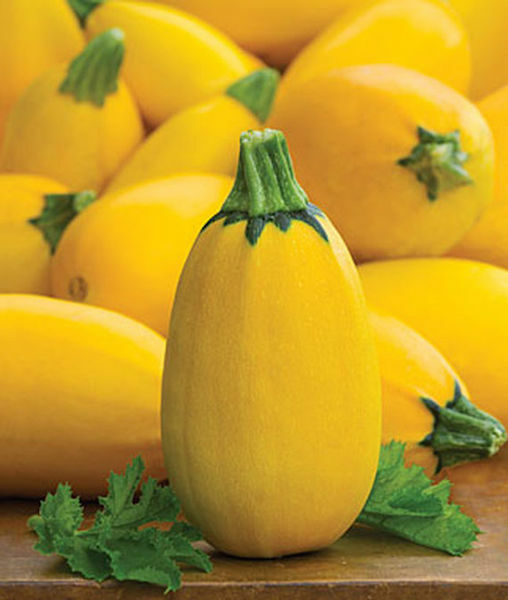 There are also bright yellow and bi-color cultivars. 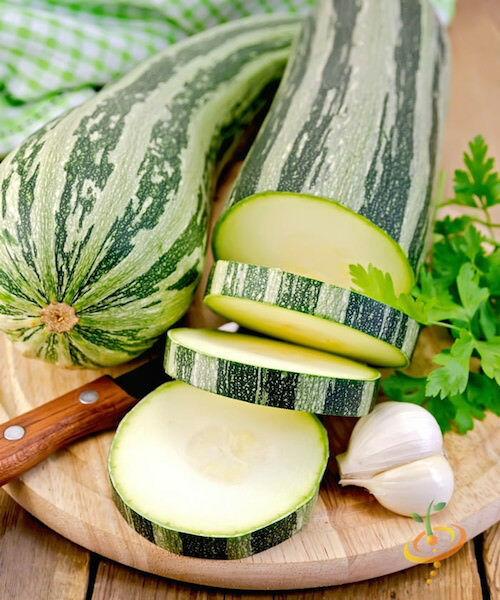 Zucchini can be smooth, or have pronounced ridges that produce star-shaped slices. Shapes also vary from the typical long thin cylinder, to bulbous at one end, to egg-shaped and even round. Pay close attention to the size of harvest for each zucchini variety in the descriptions below, and try to harvest at or near that size. 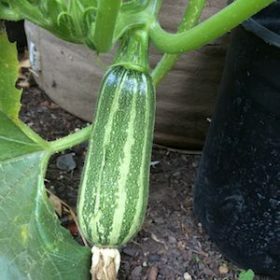 Cylindrical zucchini should be harvested at the recommended size or smaller, while heirloom, bulbous zucchini can be harvested a little larger. Flavor, of course, is another consideration. 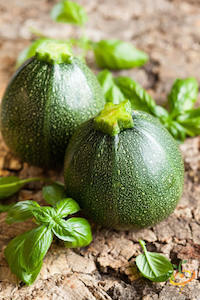 Most zucchini are bland, and take on the flavoring of what they're cooked with. They offer a pleasant, moist crunchy texture to vegetable sautes. But some have an almost nutty flavor. The Middle Eastern Cousa squash are known for deep flavor and dense flesh that stands up well to grilling. Vine Size and Habit are another thing to consider to when selecting among zucchini varieties. Even bush-type zucchini need 3-4' (1 m) of space to grow in. Heirloom and older zucchini types can be larger, and take up more space. They may also have spines on the stems of the fruit or ribs of the leaves. 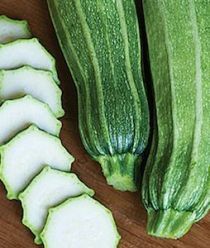 Some heirloom and most of the newer hybrid zucchini varieties are selected for compact, bushy habits and minimal spines, so they're easier to harvest, and work better in small gardens. If you don’t have much space, or if you’re growing zucchini in containers, look for compact bush varieties in the descriptions below. ‘Raven’, 'Black Beauty', ‘Bush Baby’, and ‘Patio Star’ are the best varieties for container gardeners. Finally, Disease Resistance can be important for some gardeners. If you live in a wet climate, look for varieties with some resistance to powdery mildew, and allow more space between plants for better air circulation. 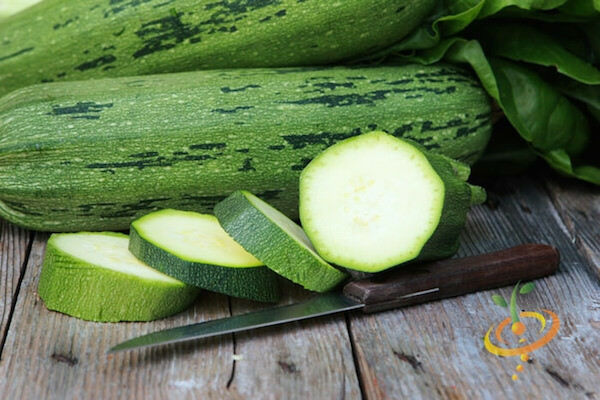 If yellow mosaic virus is a problem in your area, look for resistant zucchini varieties. All seeds featured on this site are non-GMO. Organic seeds are, by definition, non-GMO. Most varieties featured here are organic, but some varieties are only available as non-organic seed. Don't let this prevent you from trying a variety that looks interesting. NOP (National Organic Program) guidelines allow the use of non-organic (but not GMO) seeds when organic seeds for that variety are not available. The way the plants are grown (without chemical fertilizers, pesticides, herbicides, or fungicides) is the primary determinant of whether they're grown organically. Links to buy seeds go to seed companies that offer that variety. We are affiliates of Seeds Now and Burpee Seeds. We receive a commission on seed orders you place to these companies (the commission comes from the company, so you pay the same whether you click on our link or order directly from the company). Commissions help pay for maintaining and updating this web site. Links to other seed companies are provided as a service, we receive no commission from them. Links open in new windows. ‘Black Beauty’ (Heirloom, Open Pollinated,110 Days) has long been one of the most popular varieties on the market. 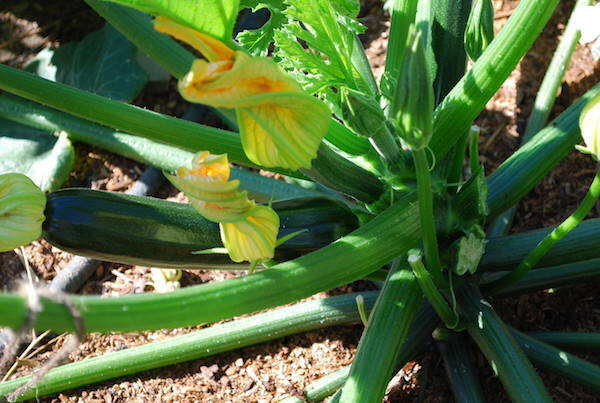 It produces glossy green zucchini over a long season. Harvest at 7-8" (18-20 cm). 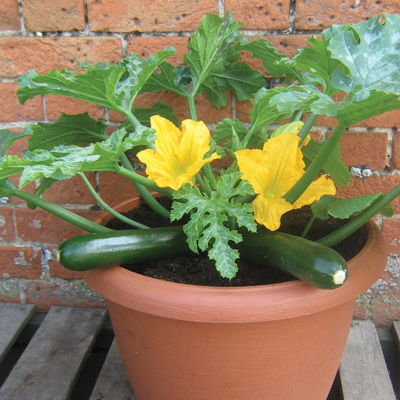 Compact bush variety suitable for small gardens and containers. .
‘Raven’ (F1 Hybrid, 48 days) produces deep green zucchini that are loaded with leutein, an antioxidant that helps protect the eyes from UV damage that contributes to macular degeneration. Compact bush plants kick out 2-3 zucchini per week at peak, so you’re not inundated with squash. Skins stay tender up to 9-10” (22-25cm), but harvest at 6-8” (15-20cm) for best flavor and texture. A good zucchini variety for small spaces and container gardens. ‘Fordhook’ (Heirloom, Open Pollinated, 57 days) produces cylindrical, smooth, medium mottled green fruits, some may be slightly curved. Flesh is creamy white, good texture. Harvest at 6-8" (15-20 cm) long. Vigorous, bushy plants spread 4-5' (1.2-1.7 m). All-America Selections winner. ‘Dunja’ (F1 Hybrid, Organic, 47 days) produces high yields of dark green, straight zucchinis. Open plants and small spines make for an easy harvest. Some resistance to watermelon mosaic virus, zucchini yellow mosaic virus, papaya ringspot virus, and powdery mildew. 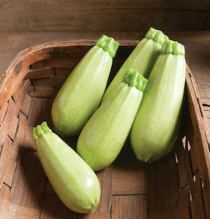 ‘Gadzukes’ (F1 Hybrid, 55 days) produces dark green Italian-type zucchini with light green ridges, so slices are star-shaped. Similar to 'Italian Ribbed' below, but on a compact, upright bush. Sweet, crisp zucchini with good texture. Upright, vigorous plants with open habit. 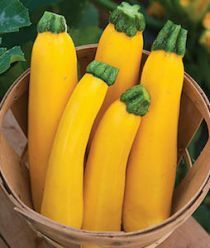 ‘Gourmet Gold’ (F1 Hybrid, 55 days) produces beautiful, bright orange-yellow zucchini. Medium-sized plants are bushy and open, so harvesting is easy. Virus-resistant, produces over a long season. ‘Cocozelle’ (Heirloom, Open Pollinated, 50 days) produces beautiful, leaf-green fruits with darker green streaks. Slight ridges become more pronounced on larger fruit. Best harvested at 8-10" (20-25 cm), but 12" (30 cm) cocozelles are still tender and delicious, and are excellent stuffed. Compact, bushy vines, good for small gardens. ‘Caserta’ (Heirloom, Open Pollinated, 65 days) produces beautiful, light greenish-grey zucchini with alternate, darker green stripes. Creamy, dense flesh with excellent flavor. 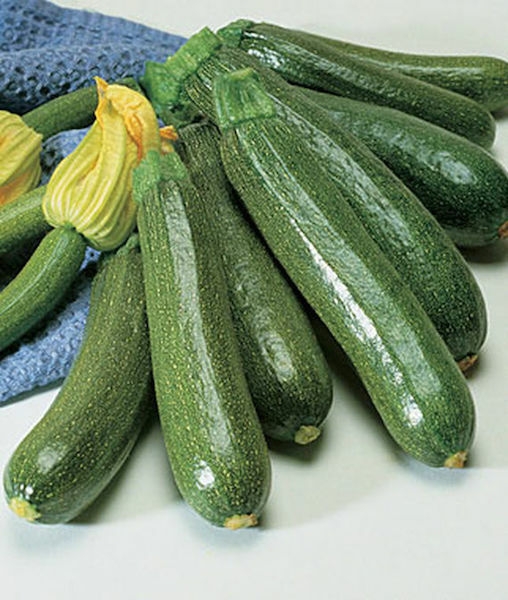 These zucchini can be harvested larger than most varieties. Harvest at 12-16" ( cm), just after the bottoms start bulbing. One of our favorites! And it grows on compact, bushy plants suitable for small gardens and containers. High yielding for an heirloom zucchini variety. ‘Magda’ (F1 Hybrid, 48 days) produces squat, cousa-type zucchini with pale green skin. Best flavor of any Middle-Eastern squash at Johnny's taste trials. Dense, nutty-tasting flesh. Excellent zucchini for vegetable sautes--especially with fresh basil--and also among the best zucchini for grilling. Harvest on the small side, 3-4" (7-10 cm) for best flavor and texture. Tall, bushy plants good for the back of a border. ‘Summer Green Tiger’ (F1 Hybrid, 55-60 days) produces gorgeous, cylindrical leaf-green fruits with bold, darker green stripes. Voted best-looking and best-tasting zucchini at Burpee Seeds. 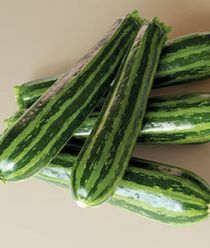 A hybrid zucchini similar to 'Cocozelle', but more uniform, and without the ridges, and with bolder striping. Harvest at 8" (20 cm) for best quality and texture. Compact, bushy vines, good for small gardens and containers. ‘Italian Ribbed’ (Italian Heirloom, Open Pollinated, 58 days) produce the beautiful and flavorful 'Costata Romanesco' zucchini that are so popular in Italy. Leaf-green fruits have pronounced, pale green ridges, so slices are star-shaped. Excellent sauted or roasted. Best harvested at 6-8" (15-20 cm). Vines spread 4-5' (1.2-1.7 m). 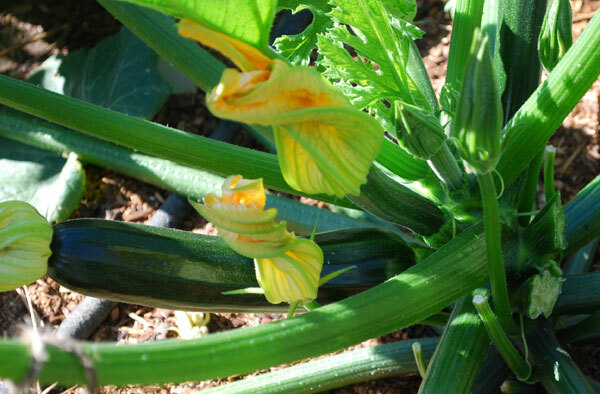 ‘Bush Baby’ (F1 Hybrid, 55 days) produces well-proportioned "baby" zucchini at small lengths. These zucchini are squatter than most zucchini, the ideal size for harvest is 2" x 6" (5 cm x 15 cm). The fruits are forest green, with lighter green striping along the ribs. Excellent flavor and texture at this size, and great for grilling. 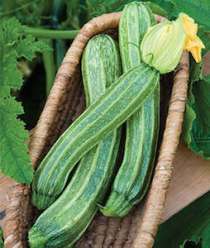 Compact bush-style plants make 'Bush Baby' one of the best zucchini varieties for growing in containers. ‘Patio Star’ (F1 Hybrid, 50 days) is bred for compact, bushy habit, specifically for growing in containers. Plants are open and spineless for easy harvest. Starts producing early and keeps producing through a long season. Beautiful dark-green leaves with silver veining make it a nice addition to any edible landscape. ‘Golden Egg’ (F1 Hybrid, 45 days) produces gorgeous yellow summer squash like elongated eggs. A favorite of chef's for their creamy, flavorful flesh, and voted the best tasting squash at Burpee Seeds two years in a row. Vines spread 3-6'(1/2-1 m), and produce for 8 weeks. Best harvested at about 4" (10 cm). ‘Round De Nice’ (Heirloom, Open Pollinated, 45 days) produces round, dark green fruits. Best harvested at 3 1/2" (8 cm), the little spheres are excellent for stuffing. Compact, bushy vines, good for small gardens.